I came up with this recipe out of necessity. It became absolute necessary when I moved out of downtown Salt Lake and I could no longer visit my absolute favorite Italian restaurant "Cucina Toscana", as often as I would like. This is my favorite Cucina dish, so I attempted to deconstruct it and I think I've come about as close as possible. I'll warn you; this dish is not for the faint at heart. While quick, easy, and to-die-for in flavor; I try not to think about the fat and calories I'm consuming when I indulge. That's why I save this particular recipe for special occasions and very special people. It was so fun to get together with our good friends last night and enjoy a little indulgence. Thanks J & B! We had so much fun. I just know our little munchkins are going to be good friends. 1. Melt butter in a large sauce pan. Heat until bubbly. Add Canadian bacon and stir until just heated through. 2. Add flour and stir until incorporated. Stir for about 3 minutes to cook out flour taste. 3. Add Cream and Cheese and stir until sauce thickens. 4. 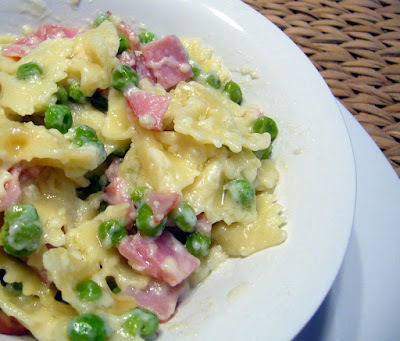 Add peas and pasta and transfer mixture into a 9x13 baking dish. 5. Serve immediately or place in the oven to keep warm. *If you live in a larger city and have access to a really good authentic Italian deli, I would use a really good Italian ham, cut into thick 1/4 inch cubes. I unfortunately don't have easy access to a deli, so I've found the Canadian Bacon to give the best flavor. Keep in mind that the rich ham flavor is the key to this dish. Looks delicious!! You can never go wrong with heavy cream and parm. So good! Mindi, maybe you should do a cooking intervention on my behalf. I just finished re-editing Reese's pictures. I will bring the disk over tomorrow when my boys are at school.